Keep track of your sales by location or buyer. Click on Locations in the left-side menu and look under the Sales column to see how many Pieces each Location has sold. 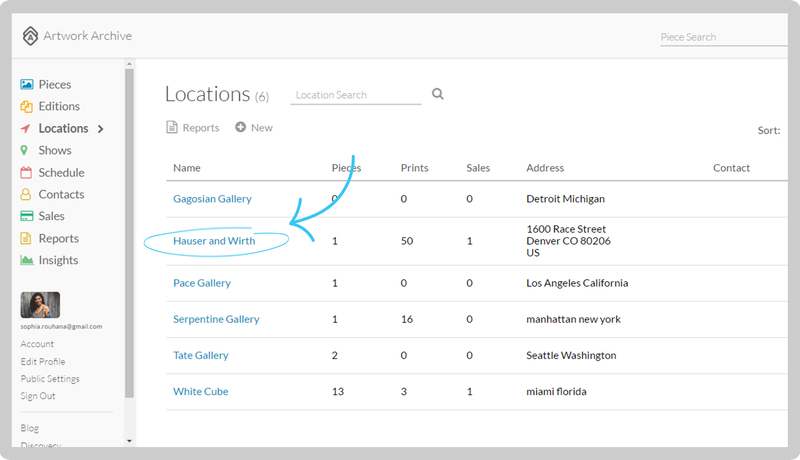 To see what specific pieces have sold from a location, click on the Location’s name and click on the Sales Records button. NOTE: The Piece must be assigned to a Location and marked as Sold first. Edit the Sale if you do not see this. To see the Pieces bought by individual buyers, click on Contacts in the left-side menu. Then click on the name of the Contact you wish to view and scroll down to see all the Pieces that Contact has purchased.